The Ram suspension system is an important part of the overall comfort and performance of your full size truck. If you are looking to lift your truck or improve handling then we've got you covered with our wide selection of Ram suspension and related accessories including Ram lift kits, Ram truck body lifts, air bag kits and more. Looking for something more subtle? 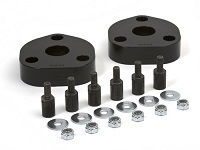 Ram leveling kits are a great choice to smooth out the stance of your truck. Save big on top brands like Rough Country, Rancho, RevTek, Firestone and more.